Not to be outdone by Fox 9's news that Robyne Robinson is leaving, WCCO busts out with its own shocker: Longtime news anchor Don Shelby is retiring. Ok, well perhaps it's not such a shocker, as Shelby is a lot closer to retirement age than Robinson, and has been hinting at it for quite some time, but still! D-Shelb has been a local news fixture for as long as we can remember! WCCO reports, "More than 32 years after Shelby's first newscast at WCCO-TV, Monday, Nov. 22 will be Shelby's last night of anchoring WCCO 4 News at 10 p.m. The following night, Frank Vascellaro will join Amelia Santaniello as the new co-anchor at 10 p.m."
Maybe we can start a rumor that Robinson and Shelby are running away together? 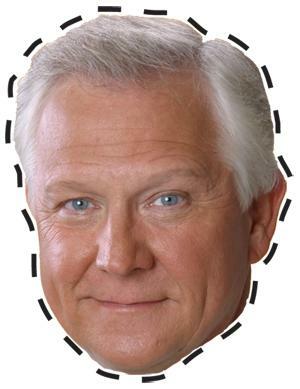 Click HERE to download a life-sized Shelby mask. Totes commemorative!